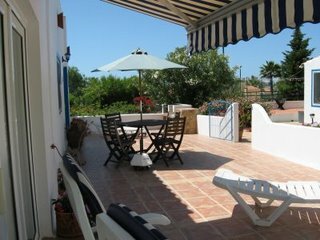 My beautiful villa on the outskirts of Carvoeiro has a solar heated swimming pool, a large secluded garden, and a separate one-bedroom bungalow style garden apartment with its own walled terrace, which is available for holidays or longer rental. 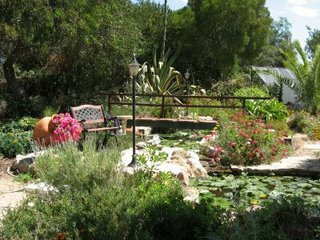 The one bedroom bungalow style garden apartment is situated on the far side of my garden. It has its own private walled terrace, and is separated from my villa by a large studio (used for storage) and shady pergola. The heated pool is in the centre of the garden and also has a walled terrace with sunbeds and seating. The bungalow has a large double bedroom, fully fitted kitchen/diner, and comfortable lounge with french doors to the spacious terrace, with table and chairs, sunbeds and Bar B Que. There is UK satellite TV, air conditioning,and a wood burning fire, and heating for those winter holidays. In fact there are all the comforts of home with use of my heated swimming pool, beaches, restaurants and golf all within easy walking distance, as well as the pretty seaside town of Carvoeiro nearby. Carvoeiro is a picturesque fishing village which lies in some of the most unspoilt coastline on the Algarve. In summer it is a lively resort, but tight regulations have restricted development . Although small it has fine restaurants and bars, boutiques, banks, a chemist and all the shops essential for daily needs. As well as the perfect sandy beach of Carvoeiro itself there are many other scenic beaches within easy reach of the bungalow, such as Centianes, Benegil and Marinha. 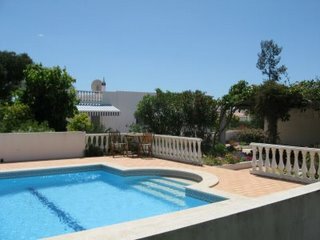 Villa with Heated Pool Carvoeiro Algarve Portugal. Holiday rental Villa.